To ensure consistent and quality healthcare, all Oregon nurses must complete a rigorous training program and pass a licensure exam before practicing. CNAs need only take a brief course at a state-approved school, like Chemeketa Community College, or hospital, like Salem Health. Chemeketa Community College also offers a lengthier 12- to 18-month certificate program for aspiring LPNs. This program covers the basics of physiology, medication, healthcare, and patient psychology. Salem’s aspiring RNs can find a local training program at Western Oregon University in Monmouth. This school offers a prelicensure bachelor of science in nursing (BSN) degree as part of the Oregon Health & Science University network. 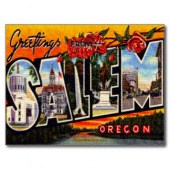 Salem is home to well over 1,000 CNAs, 300 LPNs, 2,500 RNs, and 100 APRNs. They work at a variety of local hospitals and medical centers, including Salem Hospital, Oregon State Hospital, and Salem Health Hospital and Birthing Center. These and many other facilities are always looking for talented professionals, including recent nursing graduates. If you are interested in enrolling in a local nursing program, please review the below list of accredited nursing schools in Salem, Oregon.